Note: This post is specifically intended to help USA Today readers who are new to Twitter so they can participate in our #MayoUSAToday Twitter chats. For more introductory information on Twitter, see the Twitter curriculum. Update: This week’s #MayoUSAToday Twitter chat is on concerns about memory loss. Join us from 1-2 p.m. ET on Thursday, Sept. 16. In Twitter 115: 5 Benefits of Twitter Chats, I discussed why you would want to create (or join) a Twitter chat. Twitter 116 takes you through the how. Prerequisite: It seems obvious, but to join a Twitter chat, you need to have a Twitter account. If you don’t have one yet, go to Twitter 102 for step-by-step guidance. 1. Go to Twitter.com and search for your desired hashtag. This applies whether you are joining an existing chat (like #MayoUSAToday) or creating one of your own. If you’re starting your own chat, your goal for this step is to find a tag that hasn’t previously been used. …and be sure to add the #MayoUSAToday hashtag to your tweet so it will be included in the conversational stream. There are other ways to participate in a Twitter chat, such as through desktop clients like Tweetdeck or smartphone clients like Tweetie or Twitterberry, but for Twitter beginners this is the simplest way, just using the main Twitter Web site. Is this clear? Do you have other questions about how Twitter chats work? 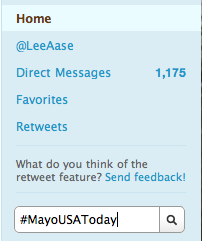 Add the #MayoUSAToday chat to your saved searches, using the first two steps listed above. For extra credit, join the conversation if you find this week’s topic interesting. Twitter chats are an amazing way to bring together people for a focused conversation on a particular topic or surrounding an event, such as a conference or Webinar. There’s no need for the people involved to know each other before the chat, and in many cases the chats can be great ways to connect with people who have common interests. For example, I frequently join the #hcsm chat for people interested in using social media in healthcare, and occasionally join the #hcmktg chat related to healthcare marketing. 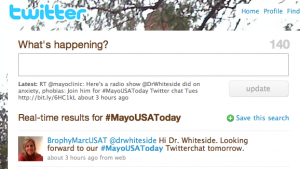 For Mayo Clinic, we use a #mayoradio Twitter chat to gather questions from outside our local area for our Medical Edge Weekend radio program, and have done several joint chats with Mary Brophy Marcus (@BrophyMarcUSAT) from USA Today, inviting readers to discuss the topics of her stories with a Mayo Clinic specialist. We’re now using #MayoUSAToday as the hashtag for these discussions. Public discussion that spreads as it continues. When a new person joins the discussion by including #MayoUSAToday in a tweet, it spreads the word about the chat to her Twitter followers. Any of her followers who retweet or reply to her tweet extend the reach still further. Broad geographic reach. Speaking of extending the reach, the beauty of a Twitter chat is it can be worldwide. Some diseases or conditions just aren’t common enough to build a critical mass for discussion locally, no matter how metropolitan the location. Getting people together physically is tough, but with Twitter you can gather people with common interests virtually without them having to leave the comfort of wherever they use their computer. And of course with iPhones, Blackberries or Androids people can join the chat from wherever they are: I did a recent chat from O”Hare airport in Chicago. No need to raise your hand. Unlike an in-person meeting, you don’t need to be recognized by the moderator to ask you question or make your comment. Just include the #MayoUSAToday tag in your tweet, and you’re part of the conversation. If you use the tag to interject your marketing messages into a discussion, you won’t last long in the chat (or in Twitter). Users will report you as a “hashtag spammer” (a term that is part of a Twitter lexicon I plan to publish) and your account will be suspended. But if you’re a real person who just wants to join the conversation without hijacking it for pecuniary reasons, you’ll find people in Twitter quite friendly and open. No time limits. Many if not most Twitter chats have a set time during which people have agreed to gather. 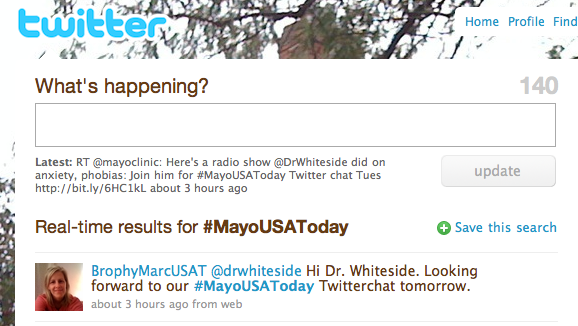 The #MayoUSAToday chats are scheduled to run for one hour, during which time our Mayo Clinic subject experts are online to answer questions tweeted by USA Today readers and others drawn into the conversation (see Benefit #1 above.) But the time expiring doesn’t mean you can’t continue to tweet using the hashtag, and the conversation can continue on at a slower pace. So if someone tweets with a #MayoUSAToday tag three hours after the scheduled chat ends, it just means the question probably won’t be answered right away, as it would during the one-hour window. This also obviously applies to conferences and other in-person meetings; just because people have gone home doesn’t mean the conversation has to end. Facebook‘s Chat functionality is really great. My youngest daughter, a big IM user, thinks it’s the best and easiest one she’s seen, and she loves how it is integrated into Facebook. I’ve had several conversations with it in just its first day of general availability. Move from only 1-1 chat to allowing chat among multiple Facebook friends. This would enable work teams to have brief virtual ad hoc meetings on a particular tactical topic without the overhead of scheduling, walking to the conference room, waiting for everyone to assemble, and returning to their desks. This could enable more nimble reactions to business opportunities. In the PR world, it could be a great brainstorming tool for story ideas. It also would make it easier to get input from the people who are typically more reserved and quiet in face-to-face meetings. Enable chat to take place in connection with Facebook groups. So, for example, if I have a secret Facebook group and would like to have a chat in which all of the members can participate, whether they are Friends with each other or not, that would be a valuable function, particularly in the work setting. This could be great for customer focus groups, for instance. Enable users to filter their list of on-line friends according to their friend lists. This may not be a big deal unless you get lots of friends and they are all on-line a lot. But I can imagine that Scoble with his 5,000 friends would have something of a cluttered window. But still, since you can search by friend name to find whether someone is on-line, the clutter may not be a problem if you are purposefully seeking out a particular individual. If you’re browsing your on-line friends looking for small-talk, though, being able to filter (say, for instance, by limiting to your list of professional friends) would be cleaner. How about you? What do you think of Facebook’s Chat function? What additional features are most important to you? Share your thoughts below…and maybe we can form a Facebook group to petition for our top priorities. Now that Facebook‘s Chat function seems to be officially out of Beta and is deployed everywhere (if it’s on my network, it must be everywhere), I got a chance to try it today. I haven’t been a big user of IM (Check that: at all.) This is completely new to me. But I can see how Chat will be a strong addition that will make Facebook even more valuable for business networking, as Adam indicates. I think of it particularly in a PR/Journalist relationship. If you can see whether your journalist friends are on-line and can send them a quick message, that will be less interruptive than a phone call. If you continually send them worthwhile news tips or ideas, you can solidify the relationship. If you start abusing them with off-target pitches, they can un-friend you…or block you. It’s one more way Facebook can put the “relations” back in media relations. I think this also has obvious applications for workplace collaborations…the ability to have conversations that are much more informal, back and forth, without the ponderous formality of e-mail. “Can’t you just pick up the phone instead?” Of course. But just as my middle daughter (in particular) uses SMS text messaging to connect with her friends (and don’t get me started on how far she went over her monthly allotment of 300 in March) instead of getting into a long conversation, sometimes a more terse interaction is appropriate in the business world, too. And Facebook Chat could be a great way to do this. In fact, I had a nice conversation with my son-in-law, Kyle, via Facebook Chat this morning (see above); I saw he was on Facebook and had the pleasure of introducing him to this new feature. Would I have thought to pick up my cell phone and call him? Highly unlikely. But when I saw he was on-line, we were able to have a chat that didn’t take a lot of time, but let us touch base. I think Chat will likely cause me to keep my Facebook status more regularly updated, too. And I like how well Chat and Messaging are integrated. I was called from my desk during my chat with Kyle, and by the time I returned he had signed off. So instead of continuing the chat, I was given an option to send him a message in Facebook. 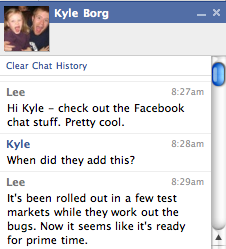 This is a great way of blending the rapid interactivity of Chat with the asynchronous tools already built into Facebook. Here’s a good Facebook Chat FAQ that outlines some of the current features for those of you who, like me, haven’t been IMers. I hope you’ll try out Facebook Chat, and if you see I’m on-line, start a conversation. If you’re not my friend yet, you can add me here, and I’ll make you part of my Blog Friends list. Which leads me to a set of feature requests and enhancements that would make Facebook Chat a really strong business networking tool. That will be the subject of my next post.